It was about 12 years ago when I was living in Belgium. One day a man came to visit me after seeing a Thangka of Guru Padmasambhava which was displaying in a organic shop "La Tsampa". He said he liked very much the Thangka in the shop and would like to order one for him. "The order is a bit special one. I would like you to paint a Thangka based on certain image which I like very much." He showed me a small piece of paper with an image printed on. 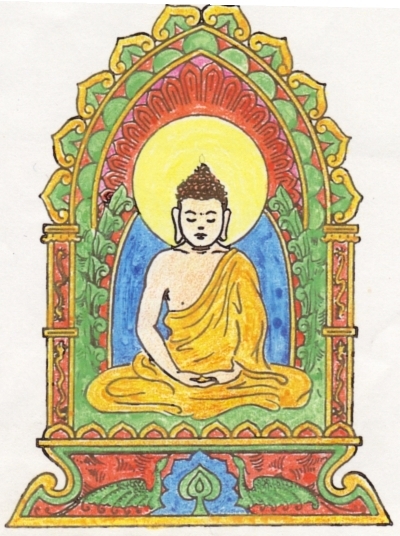 The printed image was a Buddha with monks dress sitting on a throne. "Do you want me to paint exactly same like the printed image?" "No. Though this image is what I want it's just a simple image. So please improve it when you paint." "And how about the color,,,?" "The colors should be close to this image." 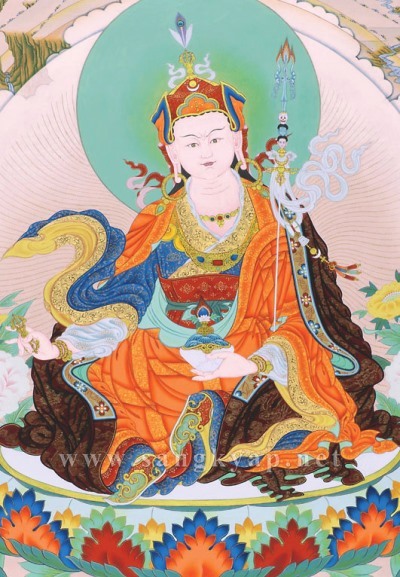 "In Tibetan tradition, the body of the Buddha Amitabha is red,, is it fine if I paint in red?" "No, I would like you to paint like the color in the print." In Thangka painting, basically it is important that the painter follow the description of the deities as written in the text and it is not allowed to modify as he wish. However as I had seen often the color of Buddha Amitabha in white or light pink color in Japanese paintings, I told him that I can do as he says. A part from the body color, he explained me several points about how he wanted me to paint it which include, the background of the deity should be plain black and all of his hair should be turning right as it is mentioned in the text, etc. The painting process took long enough time because I wasn't used to paint a non-Karma Gardri traditional Thangka and because the image he brought was quite simple, I needed to use my imagination for the details to make it looks good but without changing much from the image he gave. You can see the images of this Thangka on my website. Unfortunately we can't see much detail due to non sufficient quality of photo image. And here is, if you are interested, the image he brought me as the example.